Despite all the scholarly studies and how-to books, there’s no precise science to parenthood—and yet somehow everyone believes they’re experts on how to raise children. Another universal parenting truth? We’ve all faced judgment as well as cast criticism against others, too, whether it’s at the playground, the grocery store, or even during playdates in our own home. It’s an inescapable part of human nature, and psychologists argue that judging others is a reflection of our own insecurities. Perhaps that’s why the seemingly overly edited lives of other people on Instagram are so incredibly captivating, particularly those in the parenting space. We might follow them for lifestyle inspiration or tips, and while it’s generally understood that the images we see are editorialized, we still can’t help but compare ourselves to someone else’s “best of” reel. Consider this familiar feed: The put-together parent at the beach with their tots in tow (where do they find the time to work out? ), the glossy living room scene straight out of a catalog (how are the kids holding those poses? ), an expertly staged shot of kids eating together in harmony (and miraculously no spilled milk). Yet despite the expectations to see aspirational snapshots of parenthood, there’s a movement among readers to see more authentic, relatable imagery—but not all content creators are comfortable with public scrutiny that comes when they share unfiltered moments of their lives. Case in point: After Barefoot Blonde blogger Amber Fillerup received judgmental comments on a decidedly more “real” story that she shared on Instagram, she spoke out about the need for a safe online space free of parent-shaming. The mother of two reveals that the negativity she has faced “was really hard for me to deal with [as] a new mom … I have grown to learn to listen to my gut with parenting and not stranger’s anonymous comment.” Although she’s now more confident as a mother, “in the beginning, I already felt so inadequate that the comments made it hard,” she says. “Sharing authentically is a ‘giving’ action. You are sharing something of yourself, making you more vulnerable and more open to expressions of emotional connection,” says Pamela Rutledge, Ph.D., director of the Media Psychology Research Center and professor at Fielding Graduate University. Rutledge explains to MyDomaine this shift in readers who want to hear more honesty and rawness from bloggers: “There is always an evolution of use in any technology. The initial approach to sharing images was to share more polished and ‘perfect’ images because traditionally, pictures and portraiture were used to document special and important events or specific purposeful activities [like] business headshots." “As the use of images spread and technology changed, enabling more casual and authentic imagery, people began to questions the usefulness of perfect images as anything other than entertainment,” says Rutledge. Tech-savvy parents today “need to get stuff done, so while it may be partially entertaining to scroll through images, they also want to learn tricks to being better, more efficient, happier, [and so on]. Thus there is value on authenticity and not artificiality." With this month’s “support, not shame” theme in mind, we sat down with a handful of influential mothers to find out why they prefer to be honest about the struggles of parenthood, often sharing their personal challenges in child-rearing and relationships in the face of hostility from commenters hiding behind an “@” symbol. Here they explain how they’re answering the call for more authenticity on social media and how they’re carving out a shame-free and safe space to support other parents. There’s more to parenthood than glossy images: Keep reading to find out how these moms are leading the no-judgment movement. Honestly, the reaction from my audience has been really, really amazing. There was no social media when I was on [the TV shows] The Hills and The City, and even when I was launching my clothing line, I feel like, throughout everything I’ve done, I’ve gotten the strongest and most engagement with my YouTube series, I Love My Baby, But…. I was really apprehensive to start doing it, especially when my husband wanted to pull out the camera during my first trimester when I wasn’t feeling well. I was like, ‘My room’s so messy, the bed’s not made...,’ and he said, ‘Whitney, that’s what people need to see. They need to feel from you what’s real to get through what they’re going through too.’ I just sort of succumbed to it, but it turned out that the more brutally honest I was, the more people [could relate], so it has just been a huge eye-opener for me. It’s not just having a beautiful Instagram page and having everything professionally shot using the same filter. Those aren’t the posts that get the most engagement. I knew getting pregnant can be a struggle for some women, so putting out all these complaints about being pregnant, I expected that I would get backlash and that some women would tell me to be lucky for what I have. I always wanted to be sensitive to that. I was just scared that I would polarize a big percentage of my following. I think it’s really such a personal thing. Some people don’t want to show that side of them. Some people are really private and they want to have a planned photo shoot, and there’s certainly an audience for that. For me, I think I’ve learned that putting on this front of what life ‘should’ look like doesn’t really matter. If you’re going to make a job out of social media, then showing the real stuff is what really means something. It wasn’t until I started doing the YouTube series that I felt my social media existence meant anything. Now I feel like I’m doing good, and really showing the grittiness of life has made me feel better about myself. You have to have a tough shell. My husband didn’t sign up to be on a TV show or be on social media. He can take it so personally. For me, the majority of comments and responses are positive. Even if you are going to get a negative response, the more you are putting yourself out there and being honest, the more conversations can be had about all the ways you can be a parent. People think there’s a right or a wrong way to do things. I’ve had a really hard time putting certain content up there. Not every baby is the same, so it’s really hard to give your tips and opinions. Everything has to be prefaced with that. Parenting is so subjective. At the end of the day, everyone needs to realize—and I do think the majority of my followers [do]—we are all just trying to be our best, and everybody needs to be more supportive and understanding of that. What’s one person’s best may be another’s worst, and that’s totally okay. Honestly, I feel like I got lucky somehow because I always chose to express my life as an open, unedited book online. Sure, I still post mostly pretty images and I have strived to from the beginning, but I feel like most readers came to my blog and social accounts because I never held back from the real and hard stuff in life. Through breakups, illnesses, awkwardness, whatever, I’ve sort of always put it out there. Even this week alone, I’ve received countless messages saying ‘thank you for your realness.’ So while every image may not show the hard and real moments of life, my readers certainly aren’t surprised when I open up about the hard stuff. And I think and hope they’re grateful for someone very real, human, and flawed to relate to. Maybe it’s naive, but I went full force into sharing my life without reservations. I’ve always been that way. I’ve always been someone who was up-front and completely honest about everything. My theory in life has been and will always be: If you put your full self out there, then it’s all there, you’ve got nothing else to lose. People will judge regardless, but at least they can judge the full image, your full self. I guess the things I question are mostly in regard to my daughter—how will she feel reading about my struggles or the struggles her dad and I faced against each other? How will she feel with my whole life out there? But then I guess at the end of the day, I just hope for the best. I hope that she will appreciate me being my full, authentic, genuine, and vulnerable self. I do think it’s important to show your true, real self and life on social media, but I also feel that it is by no means required. Social media is a way for one to express themselves—there is no rule saying you have to show the harder and messier moments of life. You can show what you want to show. And in an ideal world, you should and would be able to do so without judgment. For myself though, I do find it to be a priority. I keep my blog and I write to share my own story— a real documentation of my life, unedited. That being said, happy images make me happy. And I make it a point to share as many happy photos as I can, even through the hard times. I believe in living and showing by example. I think all we can do is put our very best out there and be an example of what we want to see in the world. Maybe if I (and everyone else) lives showing their full selves and “real” lives, then other people will feel comfortable to do the same. If we want to live in a world with less judgment, we have to judge less. If something bothers us or offends us, it’s our responsibility to ask ourselves why these emotions are coming up. I think often if a statement or photo makes us feel uncomfortable our first reaction is to judge and attack, but I think our first reaction should be an internal question of “why?” It also helps to verbally support those who are making the change. If someone is posting more real photos, let’s raise them up and cheer them on. Even as something as simple and sometimes trivial feeling like a “Like” or an emoji on social media shows support in tough times. Whenever I’m transparent with my readers, the response is usually pretty positive. There’s this moment where we all digitally say “I’m not alone.” I remember one time in particular where I was having a rough week, my hair wasn’t combed, house untidy, and my kid was running around. So I shared my truth with my followers, and from that, I had a mama meetup in Central Park and we all got to share the high and low moments of being a mother. My biggest reservation was backlash being directed at my son. I was very open about my breastfeeding journey and would breastfeed in public whenever and wherever. I also took pictures of myself nursing, and a lot of people didn’t feel that was appropriate. We didn’t stop breastfeeding until he was over 2, and I still took pictures, and there were times when things got very hostile and perverted in the comment section. I think it’s very important to share the real you. Often, on social media, people create a facade and “do it for the ’gram,” which unfortunately leads to others to begin to compare themselves to others. It also perpetuates perfection, as there are some people who won’t post a filter-free photo or they alter their body shape to appease others. I think what people fail to realize is a picture only shares so much. We don’t know what happened before or after that picture. Essentially, we are only getting what people want us to see from a picture. One thing I hate about the internet is the sense of entitlement many users have. I [support] freedom of speech, but if I post something you don’t necessarily like, then keep scrolling or simply unfollow. Being a mother is not an easy task. Every mother wants to feel like she has all the answers, and for a mother to come on the internet to express that she doesn’t have all those answers is huge! The only way it can be encouraged and more acceptable is for mothers to keep sharing their truths and for the media to also portray real motherhood—both the unedited and the overly filtered. Whenever I share “real” photos—our house being a total mess or the fact that I haven’t changed out of my robe in three days—the response is always something positive. I get tons of messages back that are something like, “me too!” and readers saying thank you for sharing the real side of motherhood because it’s most definitely not always pretty. I honestly didn’t have any reservations about sharing the real and raw side of parenthood because it was something I so admired from other bloggers and influencers. It’s not always easy being open about personal things like your child’s birth and all that comes with it or breastfeeding, but those are real things we experience. I was extremely nervous about childbirth and understand that other soon-to-be mamas are probably in the same boat, so calming any nerves and just being honest about what’s to come is what I’d want to hear, so that’s what I did. I hope that by sharing our own real experiences I’m able to help other moms out there struggling with the same thing. Even if I can’t fix their problems, they at least know they’re not alone—and that is huge. I do think it’s important to show real scenes. As bloggers, photos are often styled and staged (I do plenty of that too), and while those are pretty and eye-catching, I think it can be discouraging if that’s all your readers ever see. It’s easy to share the good stuff, but we all know life isn’t perfect, and showing the real stuff reminds everyone that you’re human too. Ugh, sadly, mom-shaming is real. I’m thankful to have not had any of this happen to me yet, but I’m sure it will eventually. It’s so sad to see other mothers throwing judgments at other mothers. We all know it’s hard, and we’re all doing the best we can. Every parent has the right to raise their child the way they think is best, and by reminding readers that we’re not being real to tell you what you should do, we’re just sharing our experience. Most of us aren’t claiming to be experts in the field of parenting, but we’re simply hoping to connect with other parents. The response has been amazing. I find that many women crave more shared authenticity than perfectly placed imagery. We are constantly bombarded with information at all times of the day, and I can guarantee it’s information that makes us feel like we’re not adequate or good enough. Can we just say that motherhood is hard and it’s scary? I have a little girl who wants to look, walk, talk, and be just like me—the pressure! People connect more with mothers when they can relate to your struggles and realness of everyday life. Honestly, I felt like I was going to offend someone or I would sound like I was complaining. How I was able to get past that was understanding who I am as a mother, what my intentions are when I share, and to embrace it all because it’s my story. I can remember in particular when I had it in my heart to share my story. I was so nervous and wondered if people would get it. The response I received was way more positive than I thought, and I am so glad I put my fears aside and shared it. Plus, I birthed a human, and the experience is hard. I don’t have anything to prove to anyone. The messages I get from women who can relate to my struggles, my fears, and my frustrations are amazing. It’s nice to see a beautifully lit nursery or living space that’s all white with perfectly placed trinkets and a fur rug with children perfectly dressed and properly placed. However, women should know what’s real life, and that it’s okay if their homes aren’t perfectly kept, it’s been a week since they’ve done their hair, toys are everywhere, and your toddler is screaming because you gave her the wrong color spoon. While Instagram is known for favoring beautiful images, I think it’s important to show women that I am a woman who doesn’t have this motherhood thing figured out either, but we’re in this together. I think the first way to encourage this is encouraging conversation around this subject, whether through forums, live streams, or simple questions to ask on social media. As content creators, we have fallen into the trap of posting what we think people will double-tap and what Instagram’s algorithm will favor. I always tell other creators that there’s no one who can tell your story like you. Own it. Embrace it. I think this interview shows that the MyDomaine community sees the shift and change and wants to be a part of it. Continue to feature those stories of those who embody authenticity in their content. Let’s normalize the everyday life and celebrate those who choose to share authenticity over perfection. Since I started Household Mag in 2015, it has been my mission to share the honest, real moments of motherhood and our life as a family in general. At that time, I don’t think there was necessarily a push to “be authentic” the way there is today. It has become a marketing tool in itself, which breaks my heart a bit for those folks who are putting themselves out there for the right reasons and being vulnerable. Since being “real” has been my goal from the beginning, I have attracted readers and followers who my messages resonate with. To be completely honest, since my blog is fairly new, I haven’t always had thousands of followers. When I was pregnant with my son and just getting started, it was a lot of my friends and family who were following along. That being said, it didn’t take long for me to realize that there were other mothers dying to read and share about what they were really experiencing in pregnancy and early motherhood. But sharing my deepest, most personal feelings about motherhood honestly felt more vulnerable to the people who were closest to me, not the few new followers I had. At times it felt like an overshare, but looking back, if my experience just helped another parent, it was worth sharing. I chose to be vulnerable and put myself out there, and it has truly been the greatest gift. This is a tough one. Unfortunately, I feel like there are a lot of big bloggers out there who feel the weight of not having an honest dialog with their readers all this time and get the impression that by showing their messy home or makeup-less face that they are somehow being more “real.” Here’s the thing: If that’s your true self, 100% share those things, but if it’s not, find ways to be you. Maybe provide some context to the pretty picture you posted: It took hours to get the right shot, my kids were not into this, I felt a tremendous amount of stress, or maybe I really enjoyed styling this shot, it was a dream to work with this client—people want transparency, not artificial or forced authenticity. I think when we’re discussing parenting or motherhood in any capacity, it’s essential that we remember that 99% of people are just doing their best. Brené Brown has an incredible quote, and I think it’s so fitting here. She says, “If I feel good about my parenting, I have no interest in judging other people’s choices. If I feel good about my body, I don’t go around making fun of other people’s weight or appearance. We’re hard on each other because we’re using each other as a launching pad out of our own perceived deficiency.” If you find yourself judging or mom-shaming, the first thing you need to do is look in the mirror, accept responsibility for judgment, and deal with the feelings you’re experiencing because nine times out of 10, they have nothing to do with anyone but you. 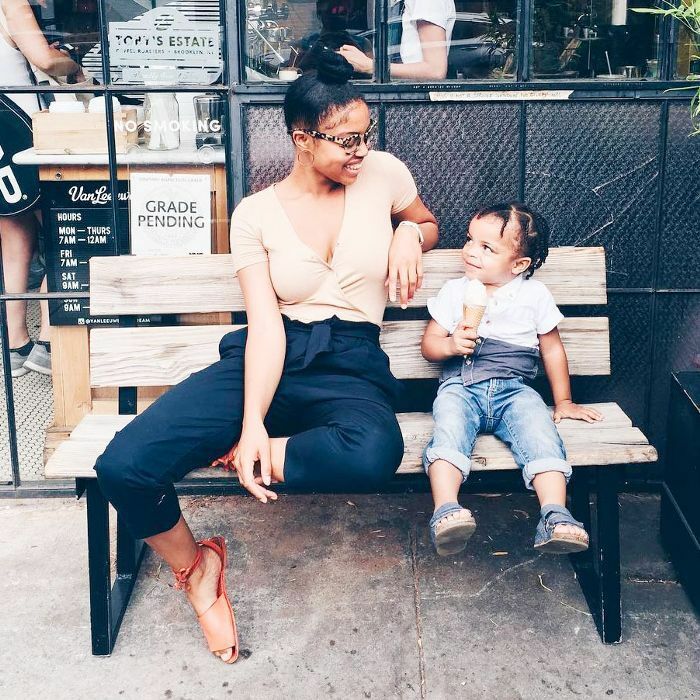 Curious to see how other parents are approaching motherhood in the Instagram age? Find out why some moms aren't taking to social media to share their pregnancy and birth announcements.